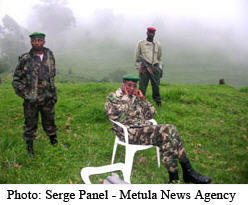 KINSHASA, Sept 14, 2007 (Xinhua via COMTEX) -- Three mass graves have been discovered in an area where fighters loyal to Laurent Nkunda, a renegade general in the Democratic Republic of Congo (DRC), have been engaged in fighting with government forces and rebel groups. "At the moment, we do not know the exact number of victims but there are a large number of people buried in the three graves," Sylvie van den Wildenberg, spokeswoman for the United Nations Mission in the Democratic Republic of Congo (MONUC), was quoted as saying on Thursday on the Top Congo radio. It would be impossible to give a figure until the freshly dug and badly covered site at Rubare, northwest of Goma, had been excavated, the spokeswoman said. Wildenberg would not say who notified the MONUC of the existence of the graves, only saying the information came after government troops moved in to occupy the base which had been used by Bravo brigade, a force loyal to Nkunda, until September 3. "MONUC immediately informed the relevant DRC judicial authorities and asked them to open an inquiry" with a view to unraveling the matter, Wildenberg said, adding that the request had been received favorably. An arrest warrant has been issued against Nkunda for alleged war crimes which were committed when his men briefly took control of Bukavu, South-Kivu, in 2004. Meanwhile, DRC Defense Minister Chikez Diemu has extended the deadline of the third phase of the Disarmament, Demobilization and Reinsertion program in the country. The minister, who addressed the press Thursday, said the decision to extend the deadline from September 13 up to September 30, had been taken with the agreement of partners such as United Nations Development Programme (UNDP) and the MONUC. The minister described the ongoing program that is mainly concentrated in the district of Ituri, east DRC, as largely successful.